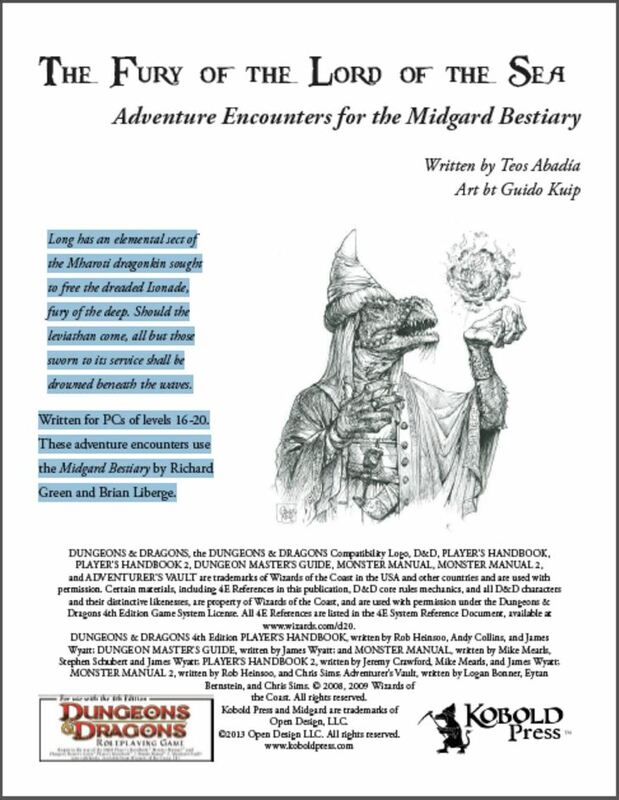 An adventure I wrote has been announced for the 4E Midgard Bestiary! 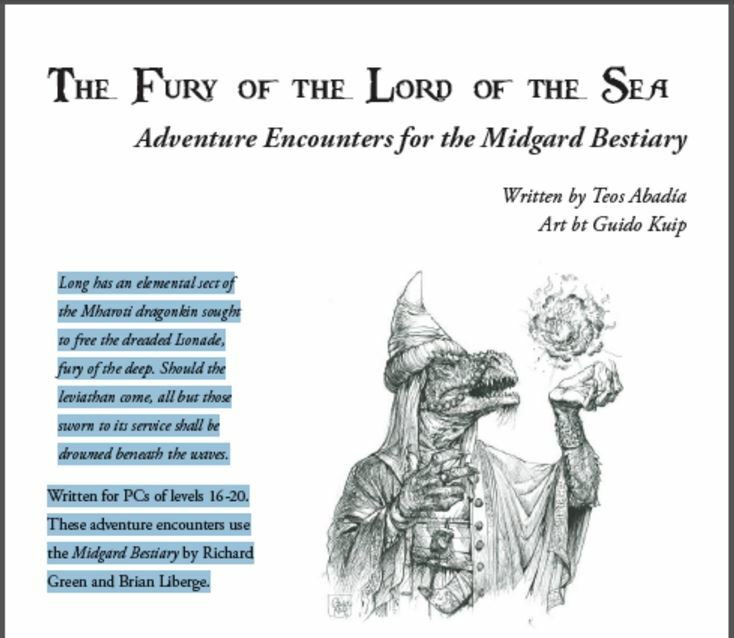 (In June 2012) The fine folks at Kobold Quarterly announced that their Kickstarter for the 4E Midgard Bestiary will include a 4E short adventure I wrote, Fury of the Lord of the Sea. Edit: Now that the adventure has been released, you can buy it at a very low price here. I had the pleasure of writing this mini-adventure. My gaming group was fortunate enough to be part of the playtest for the bestiary (a collection of cool 4E monsters) and when I heard it would be released as a Kickstarter I really wanted to see it succeed. I know how hard the authors worked on this and I wanted to support it. So, I reached out and asked if they would be interesting in my contributing an adventure. I was really glad when they accepted. I had a lot of fun writing this. In particular, it was cool to take these imaginative monsters (including a gargantuan kraken-style sea monster named Isonade) and highlight them within a 2-encounter scenario that can be adaptable to many gaming groups. The scenario can be the conclusion to an exciting campaign, can start a high level campaign, can be a development within a campaign, or can simply be a pulp-style high action one-shot adventure. I worked on various scaling options so DMs can have a fun run across a wide range of the paragon tier. This may seem like a fairly sales-oriented post, but to be honest, it isn’t meant to be. This is all about contributing to a project I like. This entry was posted on October 16, 2015 by Alphastream and tagged 4E, Authoring, Kobold Press, Midgard, Monsters, Playtesting, Pulp.